Pete may be Cheesy but the scenery certainly is not! 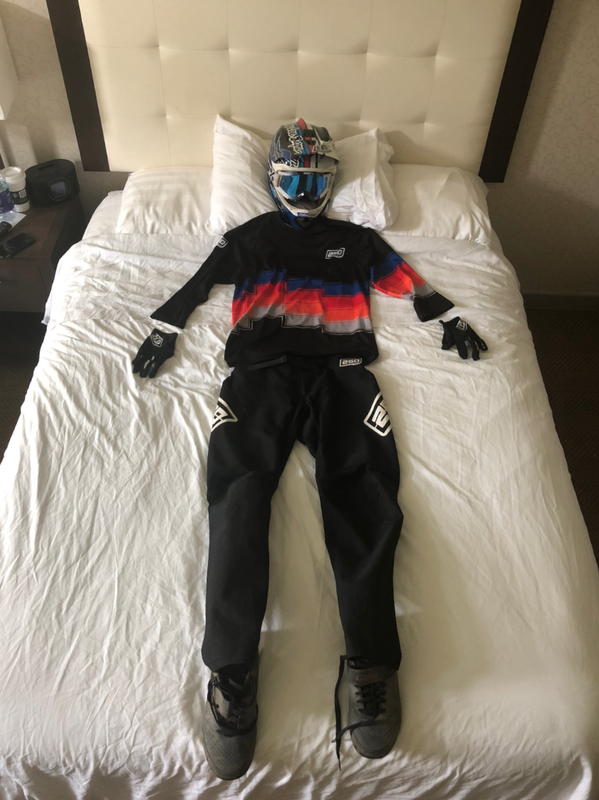 Travelling nearly 5,000 miles to go ride a bike seems a little excessive but when an opportunity opens up to visit the mecca of mountain bike resorts you quickly forget about the distance and start packing the bags and that’s what I did! To cut a long story short I have been really fortunate over the last couple of years to travel with a good friend to go ride some amazing places such as cruising through the forests of Jamaica, shredding the DH tracks of Big Bear resort and hitting the iconic Whole Enchilada trail in Moab. All trips planned to the minute so that flights can be caught and families kept happy by not being away too long. This year I had initially been thinking that instead of a long haul bike ride I would head down to the Alps for a long weekend however over a couple of phone calls a plan was hatched to cross the Atlantic and visit Whistler home to some of the best known and most iconic trails any mountain biker would dream to ride. The trip to Whistler was fairly straightforward…… catch an 8hr flight from Heathrow to Seattle then drive 4hr north up the west coast across the border into Canada and enjoy a very scenic 1hr drive from Vancouver to Whistler. Sounds like a lot however on reflection it’s only a couple more hours travelling compared to getting from home to Fort William or about the same as home to Chatel in France! Someone's happy to arrive at his destination! After a stress free trip and arriving in Whistler we sorted out our lift passes for the week, had a bite to eat and hit the sack fully stoked on getting to hit the mountain the next day…….. Well I guess you can say 4:30am is next day and I’m fully awake and ready to go, unfortunately the lifts don’t open till 10! I then spend the next couple of hours watching more YouTube videos, reading Pinkbike and Vital MTB articles, studying the trails on the Trailforks app that by the time the lifts did open it felt like I already knew the trails before even setting a wheel in motion. I had my list of iconic trails to hit during the visit including A Line and Top of the World, unfortunately to unseasonably cold weather meant the Top of the World trail was still under snow and un-rideable however everything else was open and running, game on!! Kitted out and ready to riiiiiide! The lower chair lift at Whistler send you straight over the Crankworx freeride course and you very quickly appreciate how awesome / mental the freeride guys are and also fills you with fear that the trails are going to eat you alive. To kick things off we cruised a few blue laps trying desperately to not get carried away (All trails are graded from Green/Blue/Black/Black Diamond/Orange Pro Only). After a couple of cruiser laps we took the Garbanzo lift further up the mountain and it was then the first bear of the trip was spotted just grazing on some berries about 40 meters away from one of the main trails!!!! 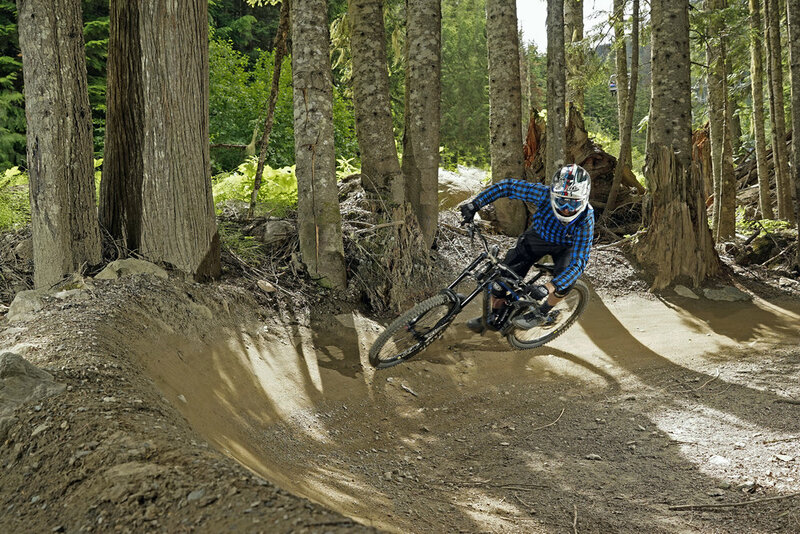 I had heard about a couple of new trails that had opened up over at Creekside which is on the quieter side of Whistler so we jumped on one of the routes down to see what we could find. These trails turned out to be amazing flowing trails that link berm to berm for a good 7-8 minutes each without more than a couple of pedal strokes and as they had only just opened they didn’t have any braking bumps!! What a start to the Whistler experience! Got on the wrong chairlift TO THE TOP but had an awesome ride down! For the end of the day we caught the Big Red lift up to the highest point we could access which was right on the snowline of the mountain. From the highest point our final run of the day was a flat out blast down nearly 7km’s of super-fast, super flowy trails with perfect shaped berms and beautifully shaped jumps any thoughts of taking it easy were well gone now and the throttle was being held wide open. Day 2 followed the same routine of day 1, start on any one of the many blue trails before testing both skill and nerve on the black diamond trails. Now we were starting to really get into the flow of the trails and having ridden some of them a couple of times I was able to start looking at possible gap jumps or sending some of the bigger jumps where I had previously been cautious. We had now been joined by AD a good friend that now lives in San Francisco but booked up flights to Whistler to join us as soon as the trip had been formulated! Day 3, now known as Super Saturday!!! Although the day started off with the sound of rain on the window I wasn’t bothered as I had my phone hooked up to Red Bull TV and watched the real professionals racing down the hill in Val Di sole at the UCI DH world Cup. These boys and girls are really next level! UK riders Tahnee Seagrave and Rachel Atherton topped out the women’s podium and Danny Hart and Laurie Greenland getting so close to taking the men’s victory, a great start to the day!! Next job was to jump out of bed and head to the pub to watch England beat Sweden in the World Cup all this before breakfast!!! We took the morning easy on the mountain before things got hot in the afternoon when we hooked up with a local dude who took us down some of the less ridden more technical trails. The afternoon session quickly progressed from blue to fill your pants double diamond black, the trails were still slightly moist from the mornings rain but thanks to some amazing trail guidance we ended up hitting some really crazy trails which were definitely a test of skill and bravery. Although the trails are visually technical they are built in such a way that rocks, berms, corners are all in exactly the right place to support you which makes for great confidence inspiring riding. Super RAD day on the mountain, making new friends and trying new stuff! Day 4 and the weather had improved a little and spurred on by Day 3’s riding, we stepped up the exploration game again and sent it down trails which we had previously scooted past. By the afternoon the confidence level was on the up and we happened to end up at the Crabapple Hits trail. 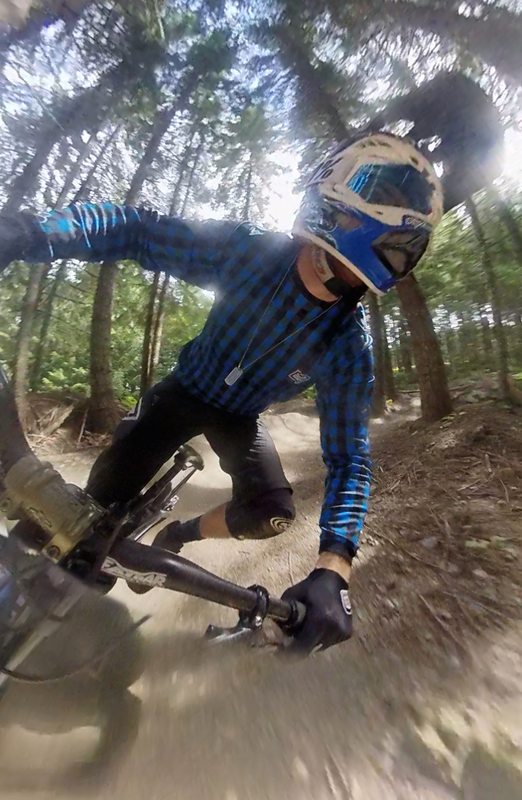 If you have seen any of the whip off world’s footage from the Carnkworx event you will know this trail well. The trail is essentially four step down / table tops that increase in size from massive to insane! The first jump is a good 15 foot step down then into a 25 foot step down and this is as far as my skill level / commitment got me……… the remaining two jumps really step up the size and they are now over 30 foot plus for the third hit and a final table top that stands about 8ft tall and around 50 foot lip to landing!!! I had thought I was riding pretty good clearing the 1st couple of hits however I was well and truly put in my place when we got chatting to a bunch of little rippers that were stood by the last hit. The group had spent the day out ripping the trails with one of the local guides and as part of their day out two of the group had persuaded the leader to two them in to the final hit so that they could clear it……… the two kids that cleared the final hit were 9 and 10 years old WTF!!!!!! Kids these days eh!!! Pushing his comfort zone on some VERY steep rock faces!! Day 5, the final day, Inspired by the little rippers on Crabapple hits today was the day to tick off all the bits that had been looked at but given a miss. 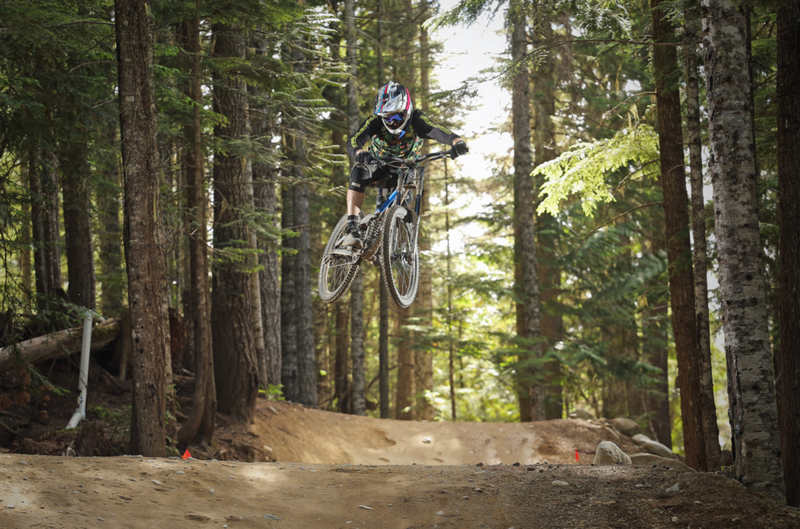 Top of my list was the super steep rock drop on Detroit Rock City, the jumps on the Dwayne Johnson trail and to ride Goats Gully which is known as the most technical trail of Whistler. Well after the mandatory warm up 100 meters on a green trail we dropped into Freight train which has some amazing step up / step down jumps, mega fast berms and rock drops, what a start to the day!!! I can’t remember any laps that day being easy ones as with each lap we took on another trail / feature whether it be a rock drop, jump, crazy steep trail or some mega wild wooden ladders…….. Basically everything that Whistler is renowned for!! What a day, what a trip!!! After the 5th and final day at the park our bikes and bodies were absolutely wrecked and although it would have been nice to spend a few more days riding it was time to pack up the gear and return back to the UK for some rest and recuperation!!! Would I recommend making the trip to Whistler to anyone remotely interested in MTB? 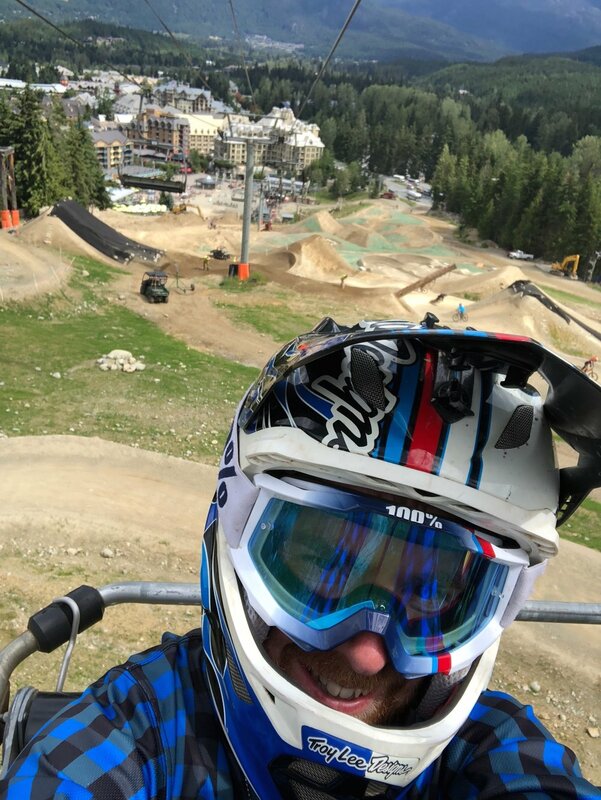 Absolutely, if you get the chance then please make it happen and tick it off the list however I promise you that one trip to Whistler may lead to another……..
Well cheers to Pete for the story, sounds and looks like an ace time was had! Pete rides A LOT! If you want to keep tabs on him, follow his Instagram HERE!